For a practical tier, that is reason enough. By the end of the day, the fly was chewed and tattered, but still catching fish. I carefully tucked it away in my fly box to use as a pattern to tie from. I have used it ever since. I can’t begin to count the number of fish I’ve caught with it. Hundreds for sure. Maybe even thousands. This fly excels in cutthroat water. Whether prospecting or sight fishing, trout just can’t resist it. In fast water they strike it with abandon. In slow, deep pools on the St. Joe River, it will bring the big boys up to the surface. In the spring it looks like a stonefly. In the summer, I guess it could be taken for a hopper. In the fall, it looks like an October Caddis. It just looks like fishy. On rivers like the Clark Fork, it makes a great point fly. While riding low in the water, the deer hair wing floats all day long and will support any nymph dropper you want to use. I needed a name for the fly. Unable to come up with anything better, I call it a Rusty Stim. It shares some of the stimulator traits: hair tail and wing, tapering head and hackle. Of course the change to deer and the wire ribbing instead of hackle over the abdomen diverge from it. Tying Notes: Tying it is similar to a stimulator pattern. Using the fine wire rib instead of hackle enables the fly to ride low in the water like stoneflies and hoppers. My favorite dubbing is a mix of Aussum Possum burnt orange and Hairline Dubbin rust. I usually apply the hackle sparsely. 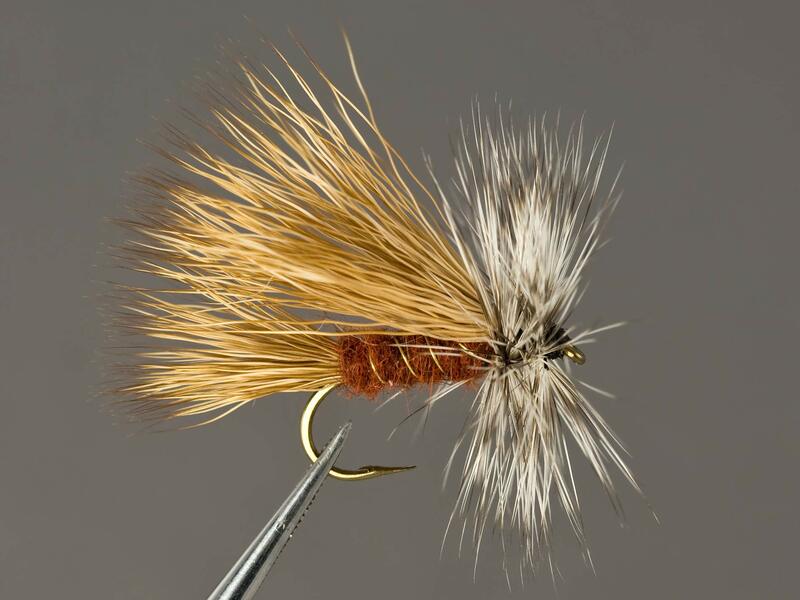 Most of the flotation comes from the wing, so the hackle is for suggesting legs, not to support the fly. I usually only tie this in a size 10. I’ve tried larger for October caddis and stoneflies, but didn’t notice any better strike rate, so I’ve gone to only the one size. Makes life easier. Whether on the Joe, Kelly Creek, or anywhere trout hide out, you can count on the Rusty Stim to come through for you.